Simpro produces advanced, high-reliability electronics and electro-mechanics for adverse environments, with its core focus on the offshore, defence, medical device and industrial sectors. As one of the leading electro-manufacturing services (EMS) suppliers in Norway, Simpro can provide a full range of services from design and development, industrialisation and manufacturing, to electromechanical assembly and testing, as well as sourcing and logistics. Simpro has extensive experience with surface mount components. With state-of-the-art production equipment and highly skilled employees, the company produces various components from prototypes to large series. Simpro’s new and modern production facilities include two surface mount technology (SMT) production lines with automated optical inspection (AOI). The SMT production lines handle components from 0201 size (0.6mm x 0.3mm) and up to 90mm x 30mm. 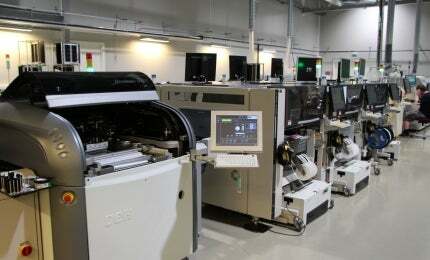 The company has two SMT assembly lines optimised for low to medium-volume production. Selective and wave soldering machines increase the production capacity and the company’s flexible manual assembly lines can be easily adapted to the running production. Simpro uses nitrogen for selective and wave soldering and it can also be used in connection with re-flow soldering if requested by the client. Traceability is secured using the company’s PCB laser marker and monitored using its new enterprise resource planning (ERP) system. Printed circuit boards (PCB) and printed circuit board assembly (PCBA) are cleaned in its new water-based washing machine, and its new selective coating and dispensing system automates the process of coating, potting and glueing. X-ray is used to secure the production process. In addition to PCBA production, Simpro offers electromechanical assembly, and experienced staff can assemble everything from modules to the final product. Simpro is certified according to ISO9001:2008 and ISO13485:2003 and is AQAP 2110 compliant. All manufacturing is done according to IPC-A-610, IPC/WHMA-A-620, IPC-7711/7721 Class 2 or 3 for workmanship and J-STD-001 Class 2 or 3 for manufacturing processes. Simpro operators are certified according to J-STD 001 / IPC-A Class 3. On request, Simpro also provide IPC Class 3 for workmanship, workmanship and documentation, and workmanship, documentation and traceability. Simpro is also Achilles JQS qualified. Simpro has a separate test department that focuses on diagnostics, troubleshooting, development and product adjustment, tuning and calibration. The company performs all test development in-house, with the focus on developing automated tests to be carried out during the various stages of the production. The testing department has enhanced instrumentation for RF testing and also uses LabView, TestStand and Boundary Scan for rapid and automated testing of complex products and volume products. Simpro offers environmental stress screening (ESS) of equipment that must withstand specific stresses. ESS is done during ongoing production, or in connection with the testing and qualification of new products. ESS tests include mechanical and thermal stress on the product and are performed during the development, qualification and manufacturing stages of the end product. Simpro performs ESS according to ISO 13628-6 Petroleum and natural gas industries – Design and operation of subsea production systems – Part 6: Subsea production control systems. Through Prevas Development, Simpro provides product design and development with hardware, software and mechanics. By running industrialisation in parallel with the development process, the company optimises the product for manufacturing and reduces the time to market. Since its establishment in 1990, Simpro has grown to become a key supplier of professional electronics. The company is located at Løkken Verk, Norway, and owns Noca AS, an EMS supplier in Trondheim.